Ni un paso atrás, siempre adelante, y lo que fuere menester … sea! On this date in 1782, Comunero rebel Jose Antonio Galan was executed in Bogota, New Grenada (present-day Colombia). 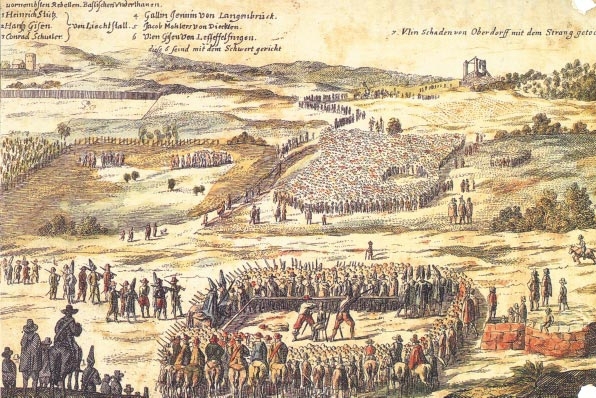 Spain’s New World precincts had risen in response to intensified taxation exacted by the empire’s modernizing reforms and particularly accelerated when Spain went to war against Great Britain in 1779; similar pressures likewise helped to trigger the 1780-1781 Tupac Amaru insurrection in Peru. In New Grenada, spontaneous resistance to new viceregal edicts coalesced into one of the most serious rebellions of the Spanish colonial era — albeit one that aimed at reform, not revolution. 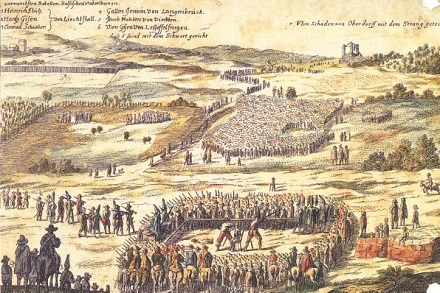 Shouting demands for tax reductions and greater local autonomy, a force of 10,000-20,000 rebels marched on Bogota in the spring of 1781, routing a column of government soldiers sent to disperse them and forcing authorities to terms that the latter had no intention of honoring. This is one of the oldest ploys: offer concessions to end the rebellion, then declare the concessions null and void as obtained under duress when the rebels are safely out of arms. An illiterate mestizo peasant, our man Galan (the cursory English Wikipedia entry | the much more satisfactory Spanish) was not the principal captain of this rebellion but he seems to have exceeded them in foresight — for Galan and his more radical followers continued the revolt even after the main body of Comuneros went home satisfied with the government’s specious pledges. North of Bogota, Galan threatened a more Tupac Amaru-like experience, attracting a multi-racial lower-class force* which he turned against hacienda landowners. We condemn José Antonio Galán to be removed from jail, dragged and taken to the place of execution, where he is hanged on the gallows until dead; when lowered, his head is to be cut off, his body divided into four parts and passed through the flames (for which a bonfire will be lit in front of the scaffold); his head will be taken to Guaduas, theater of his scandalous insults; the right hand placed in the Plaza del Socorro, the left in the town of San Gil; the right foot in Charalá, place of his birth, and the left foot in the place of Mogotes; his descendants are declared infamous, all his goods are confiscated to the treasury; his house is to be pulled down and sown with salt, so that his infamous name may be lost and consigned to such a vile reputation, such a detestable memory, that nothing remains of him but the hate and fright that ugliness and crime inspire. Despite the sentence, it’s said that an unskillful executioner not knowing how to hang his man shot him dead instead, so that he could proceed to the butchery. * The main insurrection that had so meekly disbanded itself was heavily led by Creole local elites with a clear inclination towards deal-making. 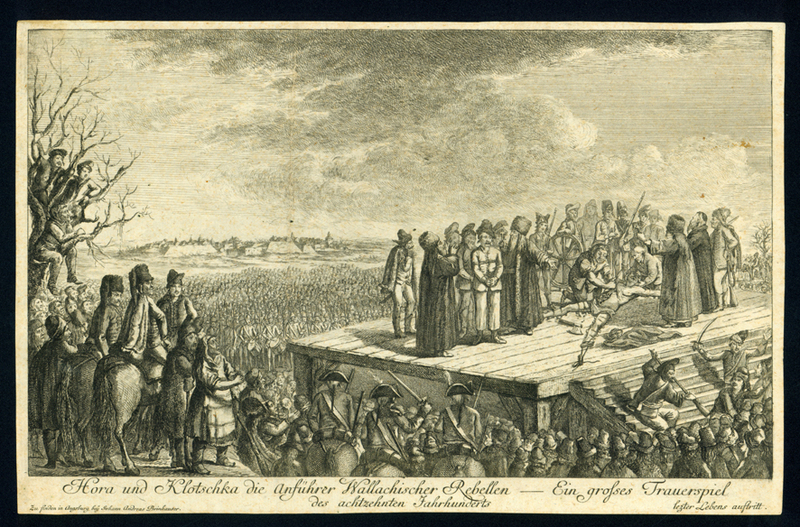 On this date in 1785, two of the three leaders of Transylvania’s great peasant uprising were broken on the wheel in the city of Alba Iulia — the third having cheated the executioner by hanging himself in his cell. 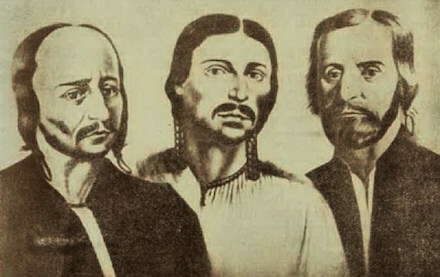 Left to right: Vasile Ursu Nicola, known as Horea; Ion Oarga (Closca); and, the suicide, Marcu Giurgiu (Crisan). The Revolt of Horea, Closca and Crisan (English Wikipedia entry | the far more detailed Romanian) featured the usual grievances of feudal serfs, who in this case were Orthodox Christians governed by a Hungarian Catholic nobility. 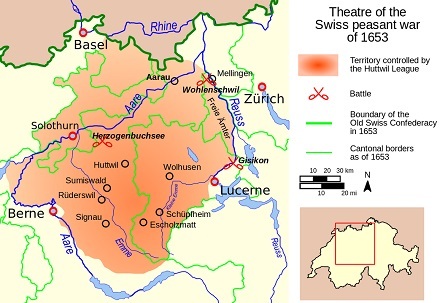 The heavier exactions of the region’s magnates in this period had led to several peasant delegations petitioning for relief from the Habsburg crown, among whose rosters appear this day’s eventual executees, Horea and Closca. But the careless injuries his modernizing edicts visited on a precarious dominion of his polyglot empire would help beat ploughshares into swords in the regions of present-day Romania. The nobility should be abolished; each noblemen, if he could get a job in the imperial administration, should live on that income. The noble landlords should leave once for all their nobiliary estates. The noblemen should pay taxes like any common taxpayer. The most immediate spark to set all this tinder ablaze would be the apparent prospect of widespread military recruitment — a desideratum for the peasantry, as it offered the prospect of social mobility and an escape from the magnate’s lash — which was then apparently withdrawn or blocked, a cruel trick to put the servile class in mind of its many abuses. In early November, beginning in Zarand, thousands of peasants Romanian, Saxon, and Hungarian alike rose in arms and began putting manors and churches to the sack. “Letters from Transylvania continue to talk of excesses committed by rebels there,” one bulletin reported. 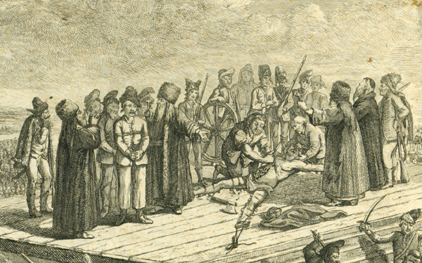 Above: detail view (click for the full image) of an 18th century print illustrating the execution. Below: another take on the scene. The Walachian uprising is an important lesson for sovereigns. It confirms the observation that the human spirit is mature for a general ferment, that it yearns for laws that respect equality, justice, and the order corresponding to its nature. How could it have been that under the most beneficent and mild government in the world, that of Joseph II, such an event could occur? It is because the principles of liberty, justice, and equality are woven into our hearts; they are a part of our natural destiny. ** And even more so in hindsight; see, for instance, this 1937 tributary obelisk. On this date in 1937, the Soviet economist Alexander Chayanov was shot during Stalin’s purges. A specialist in the rural economy, Chayanov was noted for his forward thinking about Russia’s backwards peasantry. Prevailing Marxist orthodoxy envisioned this class hurtling inevitably towards capitalism as its members sought their own advantage;* against this, Chayanov emphasized the resilience of the peasantry. And not only that, he postulated that the unwaged peasantry operated in an economic constellation alien to the classical model of value maximization — and would rather tend to relax labor once it reached subsistence production, rather than working ever onwards to attain surplus value and Five-Year Plan quotas. This theory accurately anticipated difficulty for Soviet agricultural policies like collectivization and grain confiscation. Denounced as an apologist for the refractory kulaks — official agrarian bogeymen of the early Soviet state — Chayanov was arrested in 1930 and found himself shipped to a labor camp in Kazakhstan. He was re-arrested in 1937, tried, condemned, and shot in a single day; his wife Olga also disappeared into the gulag only to be released in 1955, after Stalin’s death. They were officially rehabilitated in 1987 under Mikhail Gorbachev. Though Chayanov’s own work was cut short by his suppression, his ideas would resurface in the postwar period and find exponents among western economists and social scientists. Nor have those ideas been exclusively of interest to academics studying peasant societies; Chayanov’s emphasis on the family as an essential economic unit found an echo in the New Home Economics field launched in the 1960s by classical economists like Gary Becker, while his appreciation for maintaining a harmonious relationship to the land has been revived in contemporary Russia by Vladimir Megre‘s “Ringing Cedars” eco-cult. 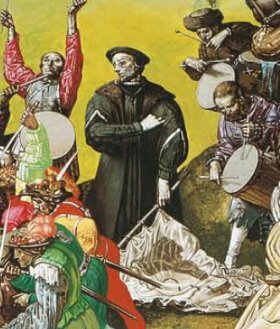 On February 15, 1573, the brief but scintillating career of insurrectionary Matija Gubec came to a brutal end when he was publicly tortured to death in Zagreb. You know what they say about the size of a man’s feet: Matija Gubec about to be crowned with a red-hot iron ringlet and quartered. Gubec emerged from (to us, at least) obscurity to leadership of a short-lived peasant uprising in Croatia against Franjo Tahi (Croatian Wikipedia link), your basic feudal tyrant. Although put down inside of two weeks, this revolt and its personification in Gubec have endured as potent national symbols in Croatia. * See Pavlakovic, Vjeran (2004) ‘Matija Gubec Goes to Spain: Symbols and Ideology in Croatia, 1936-1939’, The Journal of Slavic Military Studies, 17:4, 727 — 755. ** According to Pavlakovic, Gubec’s real given name is unknown and birth records suggest it might have been “Ambroz”. 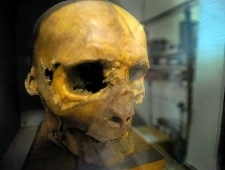 He was known as “Gubec called Beg,” using the Turkish term for a lord. 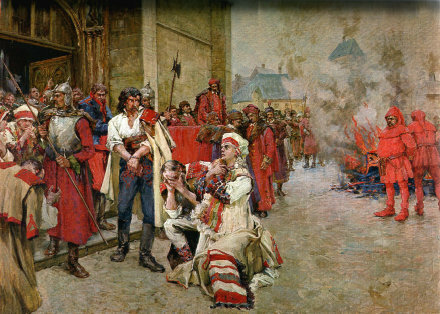 On this date in 1514, the leader of a Hungarian peasant uprising that scared the ermine robes off the feudal nobles met a punishment from the unspeakable depths of their medieval imaginations. 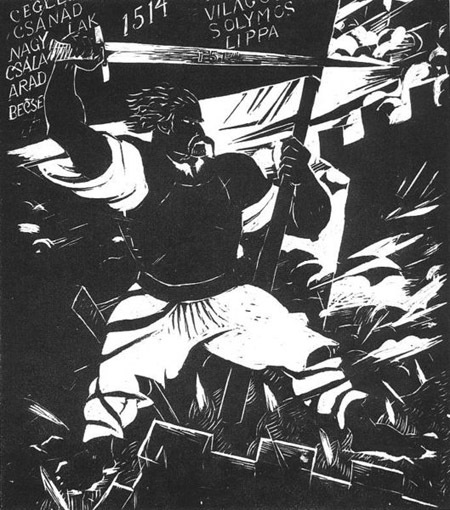 While Marki Sandor’s 1913 biographical treatment of this character — also rendered Georghe Doja or Dosa, or as György Székely for his native soil — is available online, it seems to be available only in Hungarian. 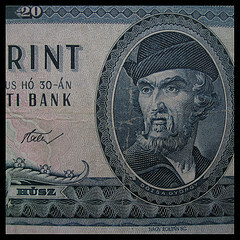 GYORGY DOZSA (d. 1514), Hungarian revolutionist, was a Szekler squire and soldier of fortune, who won such a reputation for valour in the Turkish wars that the Hungarian chancellor, Tamas Bakocz, on his return from Rome in 1514 with a papal bull preaching a holy war in Hungary against the Moslems, appointed him to organize and direct the movement. In a few weeks he collected thousands of so-called Kuruczok (a corruption of Cruciati), consisting for the most part of small yeomen, peasants, wandering students, friars and parish priests, the humblest and most oppressed portion of the community, to whom alone a crusade against the Turk could have the slightest attraction. They assembled in their counties, and by the time Dozsa had drilled them into some sort of discipline and self-confidence, they began to air the grievances of their class. No measures had been taken to supply these voluntary crusaders with food or clothing; as harvest-time approached, the landlords commanded them to return to reap the fields, and on their refusing to do so, proceeded to maltreat their wives and families and set their armed retainers upon the half-starved multitudes. Instantly the movement was diverted from its original object, and the peasants and their leaders began a war of extermination against the landlords. By this time Dozsa was losing control of the rabble, which had fallen under the influence of the socialist parson of Czegled, Lorincz Meszaros. 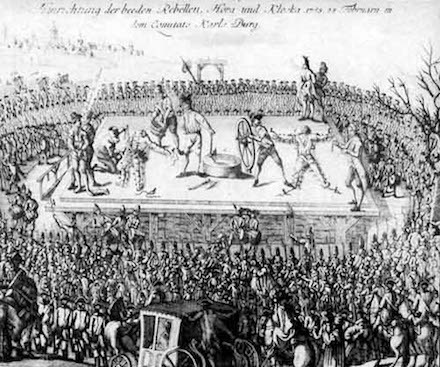 The rebellion was the more dangerous as the town rabble was on the side of the peasants, and in Buda and other places the cavalry sent against the Kuruczok were unhorsed as they passed through the gates. 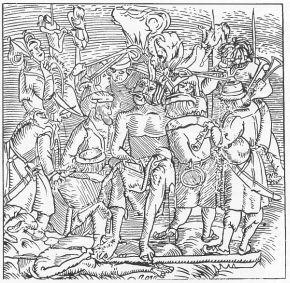 The rebellion spread like lightning, principally in the central or purely Magyar provinces, where hundreds of manor-houses and castles were burnt and thousands of the gentry done to death by impalement, crucifixion and other unspeakable methods. Dozsa’s camp at Czegled was the centre of the jacquerie, and from thence he sent out his bands in every direction, pillaging and burning. In vain the papal bull was revoked, in vain the king issued a proclamation commanding the peasantry to return to their homes under pain of death. By this time the rising had attained the dimensions of a revolution; all the feudal levies of the kingdom were called out against it; and mercenaries were hired in haste from Venice, Bohemia and the emperor. Meanwhile Dozsa had captured the city and fortress of Csanad, and signalized his victory by impaling the bishop and the castellan. Subsequently, at Arad, the lord treasurer, Istvan Telegdy, was seized and tortured to death with satanic ingenuity. It should, however, in fairness be added that only notorious bloodsuckers, or obstinately resisting noblemen, were destroyed in this way. Those who freely submitted were always released on parole, and Dozsa not only never broke his given word, but frequently assisted the escape of fugitives. But he could not always control his followers when their blood was up, and infinite damage was done before he could stop it. At first, too, it seemed as if the government were incapable of coping with him. In the course of the summer he took the fortresses of Arad, Lippa and Vilagos; provided himself with guns and trained gunners; and one of his bands advanced to within five leagues of the capital. But his halfnaked, ill-armed ploughboys were at last overmatched by the mailclad chivalry of the nobles. Dozsa, too, had become demoralized by success. After Csánad, he issued proclamations which can only be described as nihilistic. His suppression had become a political necessity. He was finally routed at Temesvar* by the combined forces of Janos Zapolya and Istvan Bathory. The radicalism of this revolt is not to be downplayed; Friedrich Engels’ The Peasant War in Germany, reports that Dozsa declared a republic and abolished nobility. This insurrectionist’s confrontation with backward power structures would offer plentiful fodder for those lands’ now-fallen Communist regimes; his name adorns many streets and monuments in Hungary and Romania. However, Dozsa was well on his way into the nationalist pantheon before Communist ascendancy. Nineteenth-century composer Ferenc Erkel, for instance,** wrote an opera about him, and poet/nationalist revolutionary Petofi Sandor saluted him in verse in 1847. 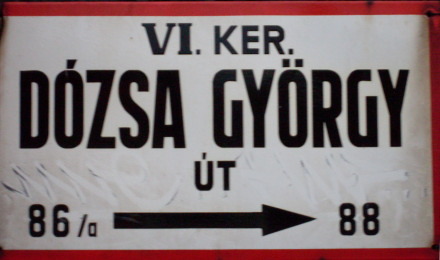 The latter text is available in Hungarian on Dozsa’s Hungarian Wikipedia page, which also attributes at least two plays about him to the Interwar period. * aka Timisoara — in modern-day Romania, where the execution actually took place. ** Dozsa was actually captured in a fortress constructed by John Hunyadi, whose executed son is a fellow nationalist martyr (playing for the traditional-authority team), and the subject of one of Erkel’s more famous operas. 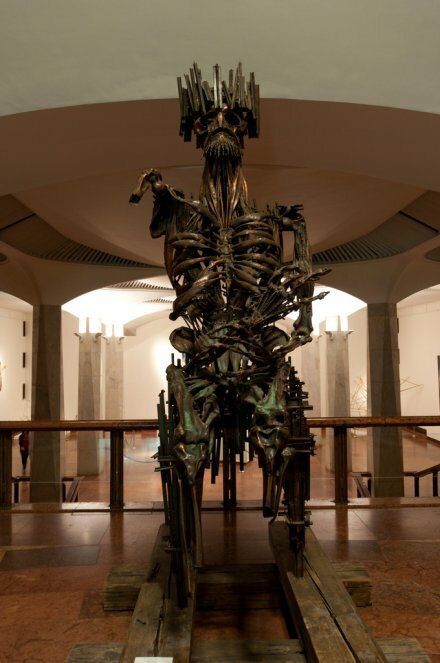 Sculpture of Gyorgy Dozsa burned on his throne, from Budapest’s Hungarian National Museum. (cc) image from redteam.